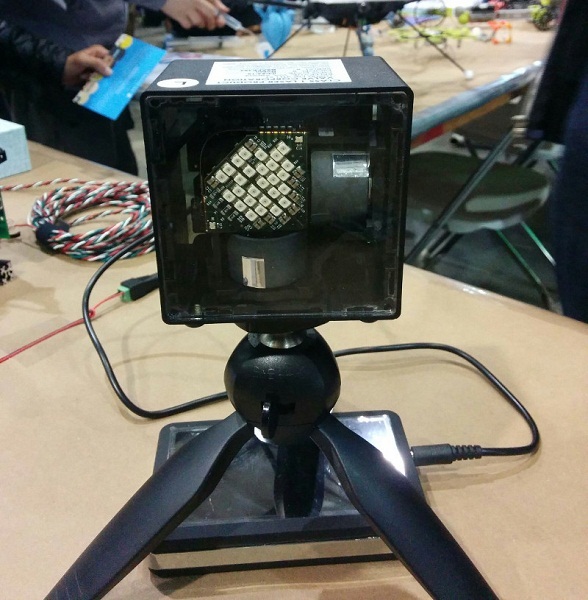 While walking around the Bay Area Maker Faire this weekend, I stumbled across an amazing piece of technology: Valve’s “Lighthouse” tracking system. Valve’s demos were (supposedly) a major contributor to Oculus’ fundraising efforts and ultimate sale to Facebook, and this device may have been a key piece of those demos. I’d heard rumors about this system for many months. It was designed for augmented and virtual reality — namely, for head and controller tracking, where it needs to have some insane specifications for positional accuracy, angular accuracy, and especially(!!!) latency. Honestly, the rumors didn’t do it justice: it’s really elegant! This solution is exceedingly simple, low-cost, light weight, and performant. It’s much (much!) better than the image processing techniques I’ve seen to date. Most importantly…. I think this technology could be a “big deal” for robotics too. I had a chance to speak with Valve’s Alan Yates about how the Lighthouse system works; I didn’t get all the specifications, but I did get some interesting information — so read on! Details at Travis’ Hizook blog. This entry was posted on Friday, July 17th, 2015 at 5:00 pm	and is filed under gadget, infrared. You can follow any responses to this entry through the RSS 2.0 feed. You can skip to the end and leave a response. Pinging is currently not allowed.